Marquesas Islands: A Piece Of Paradise You Need To Discover This Year! Back in 1842, a certain Herman Melville chanced upon this chain of islands in the South Pacific, long hidden from the world. His work ‘Typee’ later went on to introduce the world to French Polynesian islands. Of course, along with it came the conjecture of practice of cannibalism in the islands, some of which are true, and some exaggerated. Marquesas Islands This is a must for your travel bucketlist! Follow @your_travel_bucketlist_ for more beautiful travel destinations. Credits by: @karl_shakur Please visit his/her fantastic gallery for more photos like this and show some love! This group of volcanic islands in French Polynesia have been, at different points in time, described as paradise, through one euphemism or another. With a population of just 9346 people (as of August 2017), these islands are truly a gesture of nature showing off her abundant riches and beauty. Here, you will find skyscrapers, but in the form of waterfalls, you can still go for spas, but only out in the nature and you can still enjoy your retail therapy by investing in traditional Marquesan crafts such as tiki statues made from rosewood and basaltic wood, scented ornaments made from sandalwood, all handcrafted by the locals. One look out the window before your domestic flight lands here, and you’ll know that nature has cast a spell on you right from that moment. With the perfect juxtaposition of just the right shade of lush green and the azure blue of the Pacific, Marquesas bewitches its visitors even before they have landed. 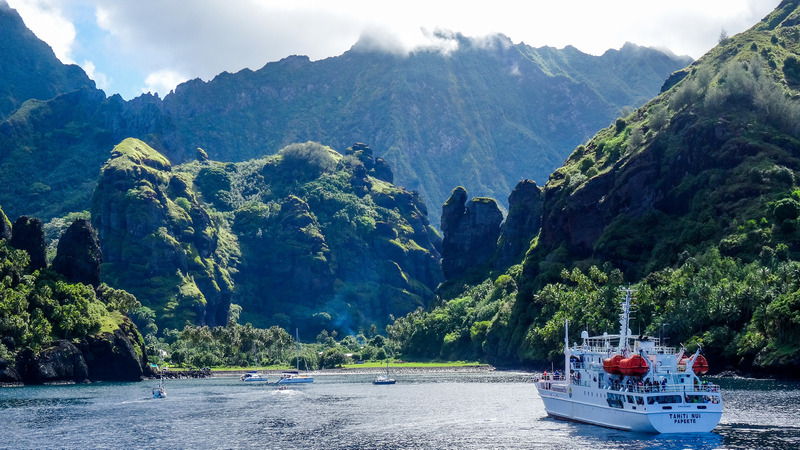 The isolation of the Marquesas Islands has so far secured it from the ill-effects of over-crowding a sensitive ecology by large crowds of tourists. This also means that those who dare to venture into these rather infamous chains of islands (what with the cannibalism reports) will receive the most rooted and genuine experience. Black sand beaches, imposing cliffs, lush rainforests hiding waterfalls as high as 1000 ft, and an occasional sighting of melon-headed dolphins from the shore may be a few of the most exciting highlights of this place, but they are only the tip of the iceberg. This untouched and untamed landscape has been protected by its inhabitants who, proud of their ancestry and culture, have peacefully co-existed with nature all throughout. Nuku Hiva, Hiva Oa, Ua Pou, Ua Huka, Tahuata, and Fatu Hiva are some of the islands that should be listed on your itinerary. You can explore the islands on horseback and even take the help of the locals to show you around. They are extremely friendly and welcoming and honestly, your only hope to seeing even a percentage of this wild, wild landscape of Marquesas Islands.